Threads of glass pulled from re-melted Bullseye Compatible sheet. For use in kilnforming or torchworking. Stringers come in 0.5 mm (“Fine Line”), 1 mm, and 2 mm thicknesses and are approximately 17.75" (451 mm) long. 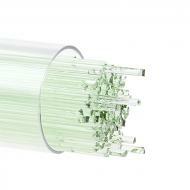 They are packed in clear plastic tubes that are 18" (457 mm) long and 0.75" (19 mm) in diameter. Tubes are packaged by volume. A tube of .0.5 mm stringer contains approximately 350 pieces. A tube of 1 mm stringers contains approximately 123 pieces. A tube of 2 mm stringer contains approximately 50 pieces. Tubes of colors made with gold contain fewer stringers, to reduce unit price. For example, a tube of gold-bearing 1 mm stringers contains approximately 87 pieces, while a tube of 2 mm stringers contains approximately 33 pieces. Click here to learn more about our gold bearing glasses. Stringers may be available in bulk quantities of ten pounds (4.5 kg) per box. Please call for more information.